BSc Hons/MOptom - Optometry at Ulster University. Did you know that most people value their sight above all other senses? That’s not surprising considering how important vision is to our everyday lives. Vision is a complicated process involving not just our eyes, but our brains and nervous system. Studying for an Optometry degree you will discover the fascinating way in which the visual system works and learn to help patients of all ages to keep their eyes healthy and achieve the best vision possible. You will explore everything from the physiology and psychology of vision, to how to conduct an eye test, prescribe glasses and contact lenses and detect signs of injury or disease (both in the eye and the rest of the body). You will practise your new skills in the range of specialist clinics that are available in our on-campus eye clinic and you will also visit local hospital eye clinics to further broaden your experience. If you are interested in problem-solving, science and working with people the Optometry degree at Ulster will provide you with the training you need to become an Optometrist. You will benefit from the small class sizes (approximately 32-36 per year), unique to Ulster, which ensures our students have excellent access to patients, equipment and lecturing staff. 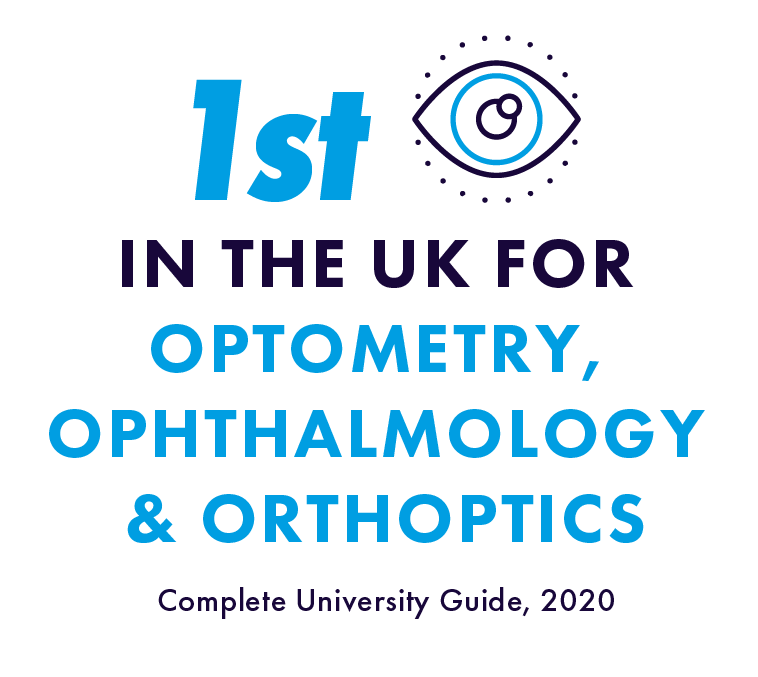 Our graduates consistently score our course in the top three of UK Optometry degrees and go on to careers in high street practice, hospital practice, the optical industry, vision science research and academia. Options are available to take a 3 or 4 year BSc Hons Optometry / MOptom programme. Progression is determined at the end of the second year with those students attaining a 60% average in second year modules eligible to apply for transfer to the Master's programme. This full-time programme of study is based at the Coleraine campus where we have a well equipped Optometry Clinic which provides eye care services to the local population whilst also acting as the central teaching hub for our students. You can find out more about the Optometry Clinic by clicking here. In addition to the extensive clinical experience gained in the Optometry Clinic and NHS placements, you will learn through interactive lectures, tutorials and laboratory sessions, where engagement in learning is encouraged through a diverse range of teaching and assessment methods. Key skills for Optometry include the ability to understand and apply scientific principles and methods, a high degree of accuracy and attention to detail, good organisational and administrative skills, good manual dexterity and strong interpersonal and communication skills. The Optometry programme at Ulster has been accredited by the General Optical Council to provide optometric education and provides the training required to become a registered optometrist in the UK or Ireland. BSc (Hons) Optometry: Three years. This module provides an introduction to the study of human physiology and anatomy to underpin further study of the pathophysiology in health and disease. This module will enable students to develop an understanding of the cellular basis of life and the relevance of studies of cell structure and function at the molecular level to human disease. In addition, it will provide a foundation for further studies in genetics, microbiology, histology and biochemistry. This module introduces students to the optics of the eye and examines how imperfections of the optical system are corrected. In addition, it introduces students to the theory and practise of refraction and the various forms of optical correction employed in optometric practice. This module is divided into three broad areas: geometrical optics, physical optics and optical materials. It aims to provide students with knowledge of optics and optical materials, particularly in relation to the eye. Students will learn about applied optics of spectacle and contact lenses and about the physiological optics of the eye. Throughout this module the student increases their knowledge of the examination procedures used in clinical practice. They will also develop their practical skills in the use of a wide range of optometric instrumentation and clinical techniques. This module examines the anatomy of the visual system as a whole and the eye as a unique anatomical organ. The emphasis is on sound working knowledge of visual anatomy for the understanding of clinical problems of an embryological, physiological or pathological nature. This module allows students to gain in-depth understanding of visual processing; through learning of aspects of spatial and temporal vision, the physiology of the retina and the electrophysiological and psychophysical techniques to measure visual function. It will provide knowledge of colour vision, motion and eye movements and visual perception. This module will introduce students to both contact lens theory and clinical practice. It will seek to develop within the student, the understanding and skills necessary to practice safely and competently, and provide a basis for further more detailed study and application in final year of the undergraduate optometry programme and in professional practice. This module will substantially broaden the students knowledge and understanding of clinical optometry and introduce them to common ocular diseases. It will also develop and refine many of the clinical skills essential to the practice of optometry. This module allows students to become competent in the use of a range of techniques appropriate for optical dispensing. It will provide a sound basis for the student to dispense optical appliances and provide appropriate advice and care to patients in the Optometry clinic in future modules. It will provide the student with a detailed knowledge of lens materials and permit the student to develop skills in appropriate lens choice according to analysis of the spectacle prescription and the patients' needs and lifestyle. This module provides students with an understanding of low vision and in the skills necessary for the optometric care of patients with a visual impairment. The module provides information on causes and epidemiology of low vision, magnification and minification, certification and registration, the psychological loss model and holistic care to include collaboration with multi-disciplinary statutory and voluntary service providers. The module will equip the student with the skills to undertake a clinical assessment of a person's visual impairment, disability and emotional status. The module provides students with training on low vision management plans including refractive error prescribing, dispensing simple optical and non-optical low vision aids, simple rehabilitation strategies and referral guidelines. Within this module students will be taught business awareness and how to manage an optometric practice, basics of contract and tort law and how these apply to optometry; and principles of healthcare ethics and how to identify and use these as guidelines in making decisions relating to patient management and care. This module introduces the student to the principles of human disease in general and in particular provides an introduction to genetics, pharmacology, pathology and microbiology. This module is designed to provide students with the requisite knowledge in human disease to proceed in their course of study. This module is focussed on two aspects of ocular disease. Firstly students will be concerned with pathology affecting the anterior eye. Secondly students will be taught introductory material on various common retinal ocular conditions. For both aspects, students will be taught how to recognize the signs and symptoms and to understand the aetiology, epidemiology, pathophysiology, signs, symptoms and terminology for the conditions. This module is further designed to provide students with the requisite knowledge in anterior ocular pathology needed to undertake management and treatment strategies. Binocular Vision and Orthoptics is a third year undergraduate optometry module. This module is designed to provide a grounding in orthoptics and binocular vision anomalies for optometric practice. Teaching methods involve lectures, practicals, tutorials and clinical experience allowing the students to approach the subject from several different perspectives to aid integration and understanding of the material. The module is taught with substantial input from orthoptic professionals to provide, not only expert teaching, but to facilitate future good relations and collaborative management between optometry and orthoptic eye care providers. This module provides the students with an opportunity to perform an independent, supervised, original research study in the field of optometry and vision science. The project will include planning a study, collecting and analysing data, and writing a project report in the format of a scientific paper. This module allows the students to revisit the elements of the eye examination routine in seeking to encourage students to consolidate and integrate learning in such a way as to enable them to examine a range of patients in a systematic manner and make coherent clinical management decisions regarding their ocular needs. This module introduces the student to the principles of pharmacology in general and in relation to the eye. The module will discuss diagnosis and therapeutic treatment of ocular disease and drug use in optometric practice. This module is designed to provide students with the requisite knowledge in ocular pharmacology and therapeutics to practice optometry successfully. This module will introduce a variety of advanced clinical procedures and concepts that will expand students' comprehension of modern optometric practice and deepen their knowledge of advanced contact lens fitting techniques. Paediatric optometry (visual development, assessment and management) is a third year undergraduate optometry module designed to provide undergraduate optometrists with an understanding of the processes underlying the improvement in visual performance seen during early infancy and childhood and an appreciation of the scientific research that underpins current understanding of these processes. The module examines normal visual development, risk factors associated with abnormal visual outcomes and the role of the optometrist in assessing and managing children's vision. This module is concerned with pathology affecting the retina, uveal tract and lens. Students will be taught how to recognize the signs and symptoms of various ocular pathological conditions of the retina, uveal tract and lens and to understand the management/treatment strategies for each condition. This module is designed to provide students with advanced knowledge in common retinal disorders in order to undertake management strategies, outline potential treatment and prognosis. This module is concerned with complex pathology affecting the eye and visual system. Students will be taught how to recognize the signs and symptoms of various complex ocular and visual pathway conditions and to understand the management/treatment strategies for each condition. This module is designed to provide students with the requisite knowledge in complex ocular and visual pathway pathology needed to detect, manage, outline potential treatment/s and propose a prognosis for these conditions. This clinical skills module requires students to demonstrate the ability to conduct a number of General Optical Council designated core skills in a professionally competent manner. This module encompasses a clinical placement within optometric practice or hospital. It will ensure students have the appropriate clinical experience necessary at this stage of their career. This module encompasses clinical placement within optometric practice. It will allow students to competently perform eye examinations on patients and to fit patients with contact lenses in a safe and proficient manner. This module requires students to draw on knowledge and skills attained from other academic and clinically based modules and professional practice so as to demonstrate the ability to competently complete the General Optical Council Stage 2 Core Competencies. This module will equip the student to develop as an optometrist; managing patients appropriately using the latest evidence-based practice and recommended professional guidelines. It will encourage self-reflection and critical analysis of clinical and communication skills. This module will equip the optometrist with further knowledge and skills to allow appropriate management of a wide range of ocular conditions that commonly present to primary eyecare. This module will equip the student optometrist with specialist skills to conduct in-depth assessment of those with cataract and/or at risk of retinal disease and allow them to follow the very latest in management protocols. This module is delivered online and allows the individual, once registered as a qualified practitioner with the General Optical Council, to participate in the appropriate locally-commissioned enhance optometric services (EOS). Grades AAB to include two science subjects from Biology, Chemistry, Mathematics and Physics (or grades AB in Double Award Applied Science or Life and Health Science). The following BTECs are not acceptable: Applied Health Sciences, Applied Science(Forensic). We may consider other Applied General qualifications along with A Levels, provided the subject requirements are met. Please contact admissionsce@ulster.ac.uk for further information. Grades H2, H2, H2, H3, H3 to include grades H2, H3 in two science subjects from Chemistry, Physics, Mathematics, Biology. You must also have Irish Leaving Certificate Higher Level English and Maths grade H6 or above OR Irish Leaving Certificate Ordinary Level English Grade O4 or above and Maths at grade O3 or above. The Scottish Highers requirement for this course is ABBBC to include grades AB in two subjects from Chemistry, Physics, Biology, Maths. The Scottish Advanced Highers requirement for this course is grades BBC to include grades BC in two subjects from Chemistry, Physics, Biology, Maths. Overall International Baccalaureate profile minimum 28 points to include 14 points at higher level to include 2 science subjects from Chemistry, Physics, Biology, Maths. Pass science Access course (120 credits) with a minimum overall mark of 70% including a minimum of 70% in each level 3 module. You must satisfy the General Entrance Requirements for admission to a first-degree course and hold a GCSE pass in English Language at grade C/grade 4 or above (or equivalent). You must also hold GCSE passes at grade C or above (or equivalent) in Mathematics and Double Award Science. Please note that for purposes of entry to this course the Level 2 Essential / Key Skill in Application of Number is NOT regarded as an acceptable alternative to GCSE Maths. Students on the Masters in Optometry/BSc (Hons) Optometry course have a joint intake. Those who enter the course and achieve an average of over 60% in the second year are eligible to apply for transfer into the MOptom programme. Health screening: You are required to demonstrate good health prior to commencing the course by completing a ‘Declaration of Health’ form which will be screened by Occupational Health who will confirm your medical fitness to undertake the course. You may also be required to undertake a vaccination programme and more information regarding this will be available prior to registration. Right from the first week of your studies, you will be in the eye clinic, where you will learn how to test each other's eyes before you apply these skills to paid volunteers in the second year. In the third year of study, you will provide eye tests and contact lens assessments for patients of all ages in our public Optometry Clinic. Third-year students also experience a range of specialist clinics both in the on-campus Optometry Clinic and in NHS placements, preparing them for pre-registration practice. The final year of the MOptom programme encompasses the College of Optometrists' Scheme for Registration and includes higher level modules taken by distance learning in specialist areas of optometric practice. The small number of students accepted each year onto the Optometry degree allows a high level of interaction between students and both staff and patients making sure that you get the best out of the experience. A wide range of teaching and learning methods are utilised including lectures, practicals, tutorials and clinical practice. Computer-based and problem-based learning are integral to the programme. Assessment for most modules is by a combination of coursework and sessional examination. Coursework may include written reports of practical work, essays, class tests, projects, oral presentations and a wide range of clinical assessments. Teaching is enhanced and informed by the high-quality research that is undertaken by academic staff within the Optometry Clinic and in the Vision Science Research Group (http://biomed.science.ulster.ac.uk/vision/). Qualified Dispensing Opticians may be eligible for exemption from specific modules including OPT102 Optics and Optical Materials and OPT306 Dispensing Practice. A student who has successfully completed Year 1 of BSc (Hons) Optometry is eligible to transfer to our BSc (Hons) Biomedical Sciences and other programmes within the School subject to approval by the relevant Subject Committees. This student would usually be exempt from the two common Year 1 modules. Our graduates have an excellent record of employment and have secured clinical, research, academic and managerial roles in the public and private sector and have progressed to higher degrees (taught or research) in the UK and Ireland. In addition to challenging and rewarding clinical roles as an optometrist in either hospital or high street practice, a degree in Optometry will also offer you career options working with charitable bodies, in industry, government service, teaching and research. To become an optometrist, graduates of Optometry BSc programmes must undertake a pre-registration year of supervised, paid practice in either a registered optometric practice or in a hospital. During this year graduates are continually assessed and take professional examinations which lead to membership of the College of Optometrists (http://www.college-optometrists.org/) and to registration with the General Optical Council as a registered optometrist. In order to enter the pre-registration year, graduates must have a first or second class degree in Optometry and have completed the Core Competency requirements stipulated by the General Optical Council. Ulster University offers graduates the opportunity to study for higher qualifications including PgCert/PgDip/MSc Advanced Clinical Optometry, studies to doctoral level and professional qualifications including the College of Optometrist accredited Professional Certificates in Glaucoma, Medical Retina, Paediatric Optometry and Low Vision. Accredited by the General Optical Council (GOC). The Association of Optometrists Prize: Best performance in the Law, Management and Ethics module. The Binocular Vision Prize: Best performance in the Binocular Vision and Orthoptics module. The Northern Ireland Optometric Society Prize: Best performance in the Patient Management module. The Johnson & Johnson Prize: Best overall performance in 2nd and 3rd Year Contact Lens related modules. The Bausch & Lomb Second Year Contact Lens Prize: Best performance in the Contact Lens Practice module. The Bausch & Lomb Final Year Contact Lens Prize: Best performance in the contact lens elements of Advanced Optometric Practice. There is a charge for health screening and vaccinations. Last year’s costs ranged from £35 to £155 depending on the vaccinations required. The criminal record check through AccessNI currently costs £33. Whilst a wide range of optometric equipment is available within the University clinics for students to use, you will normally be requested to purchase personal testing equipment during the course of your studies. In Year 1 such items are small and inexpensive and include occluders and measuring rulers. In later years, students also require an ophthalmoscope, retinoscope and trial frame. Arrangements are made for optometric instrument suppliers to speak to students about their products and significant student discounts are available. Though costs may still range from approximately £1000-£2000, such equipment is required for professional practice and will provide the practitioner with many years of service. In addition, white coats are usually required for laboratory and clinic use.